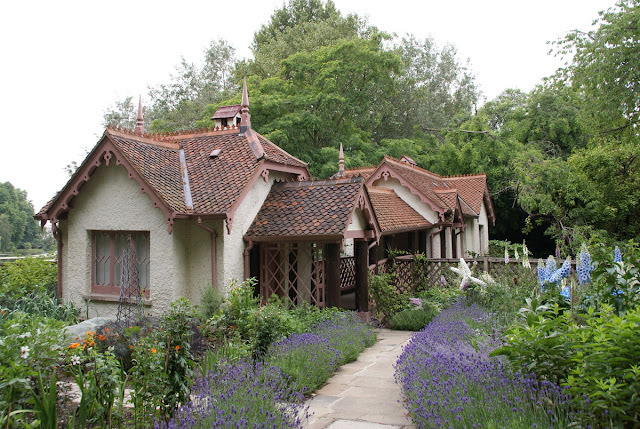 Isn't this the most adorable cottage with an incredible beautiful traditional cottage garden? And all of that in the middle of a public park? I really think this is only possible in England. I do salute the Brits for their love of gardening and their garden passion. 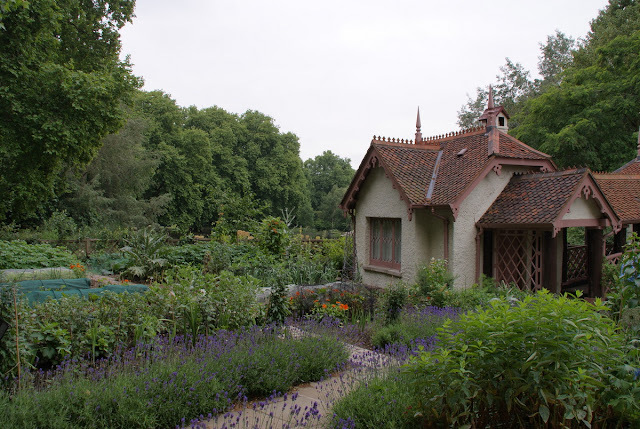 I do not know much about this lovely historic cottage and its gardens except that in 1837 the Ornithological Society of London presented some birds to the Park and build the cottage for a birdkeeper. Nowadays the cottage feels almost like coming right out of a fairy tale. 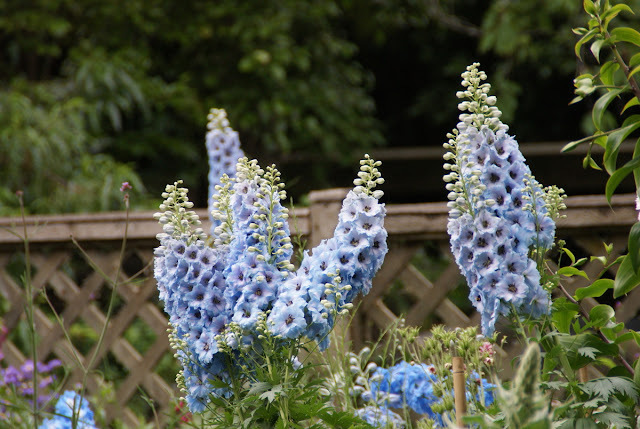 There were hundreds of delphiniums and all of them were tall and very vigorous. They simply seem to love the climate in England. How I wish I could grow this plant here in San Diego, but I am very sure that it is simply too hot and dry for it to do well. It most likely will not be anything else here than an expensive annual that you can buy at the nurseries right before it flowers and toss out of the garden a few weeks later. This photo shows the cottage from a different angle with the walkway to the front door. You can see it is a little bit tattered and crocked, probably because of its age, but all the architectural details give it so much charm. I love the edging of the walkway with lavender. To the left you can see a little bit of the vegetable garden and to the right was the flower garden. 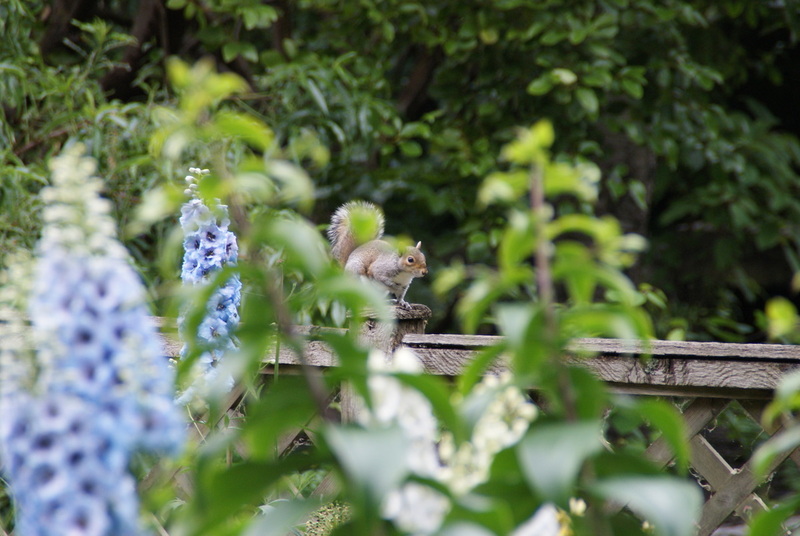 The cottage garden was loved by squirrels, too! If you follow my blog you may know already that white is my favorite color, so I was totally smitten with this white delphinium. These plants radiate so much elegance and purity. 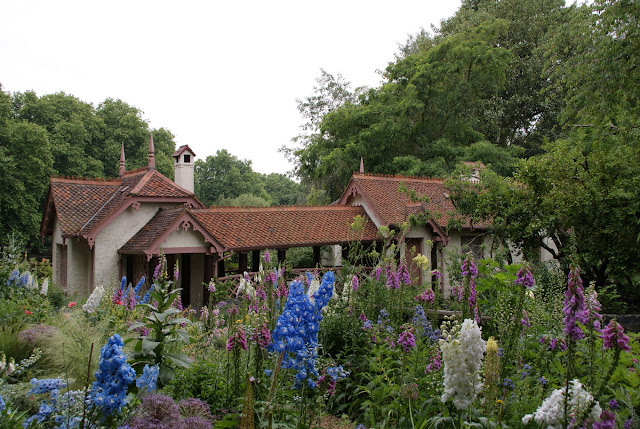 Besides delphiniums they were also growing plenty of foxgloves in this garden. I think the combination of the two plants is hard to beat. 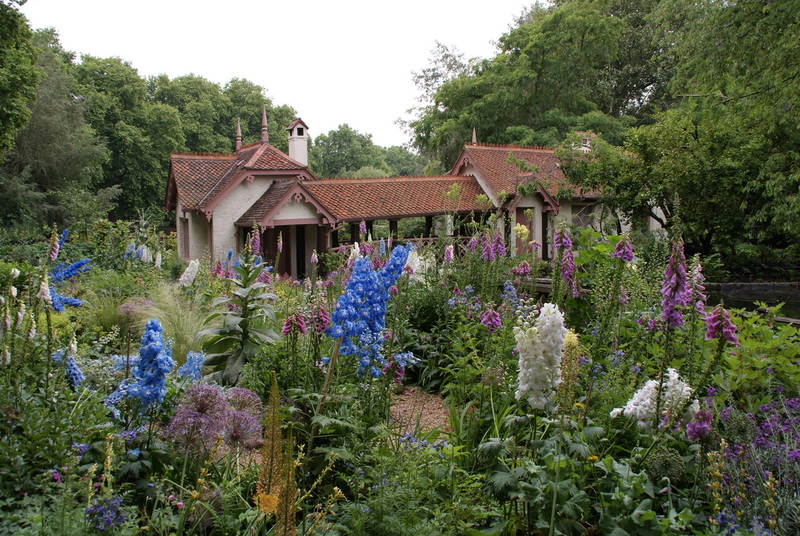 Even though it rained on and off in the days we spent in London, the foxgloves and the delphiniums looked quite decent and not battered too much by the rain. If you look closer, you see there is a reason for this. The delphiniums were staked. How much work is it to stake that many delphiniums by hand? I am really speechless that people go through the hassle to do this for the love of gardening. In our times were everything has to be fast and effective mostly at the cost of quality. Seeing this to me is food for the soul. Another view of the flower garden part of the cottage garden. Above you can see the vegetable garden a little bit better. Unfortunately we did not take closer photos of that part of the garden. I guess we had been already tired. But the vegetable garden was as meticulously kept as the flower garden and there was a bounty of veggies growing. 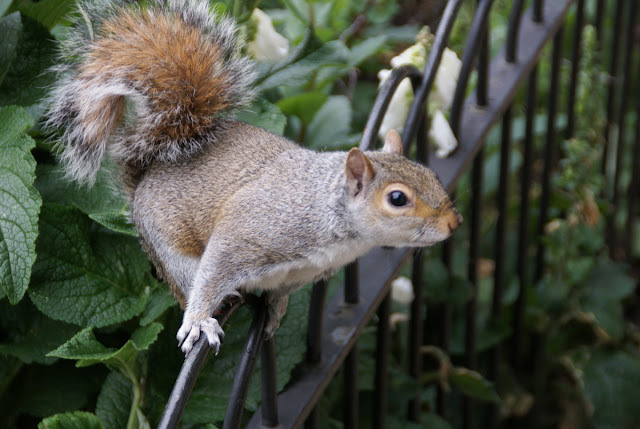 The squirrels were very tame and demanding you to feed them. This little guy was balancing very elegantly on the thin fence of the cottage garden. He came so close I could have touched him. 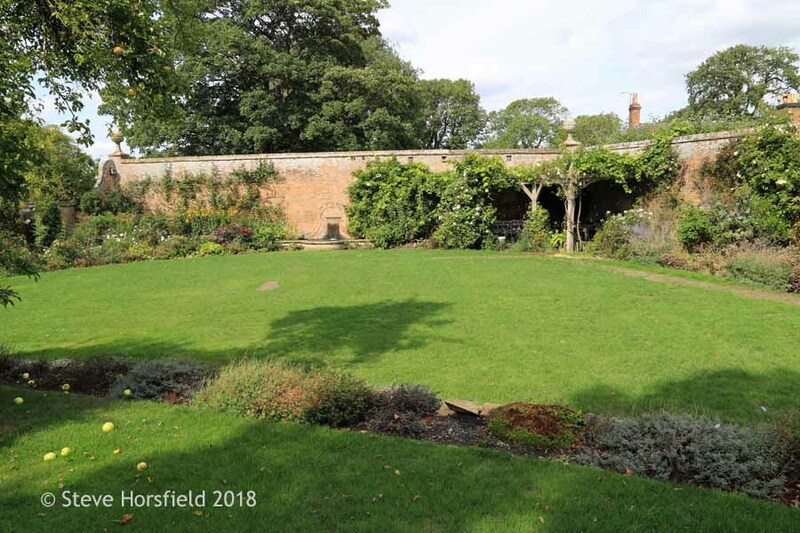 At a second glance I also saw that they were growing lady's mantel (alchemilla mollis) and oriental poppys in the flower beds, too. 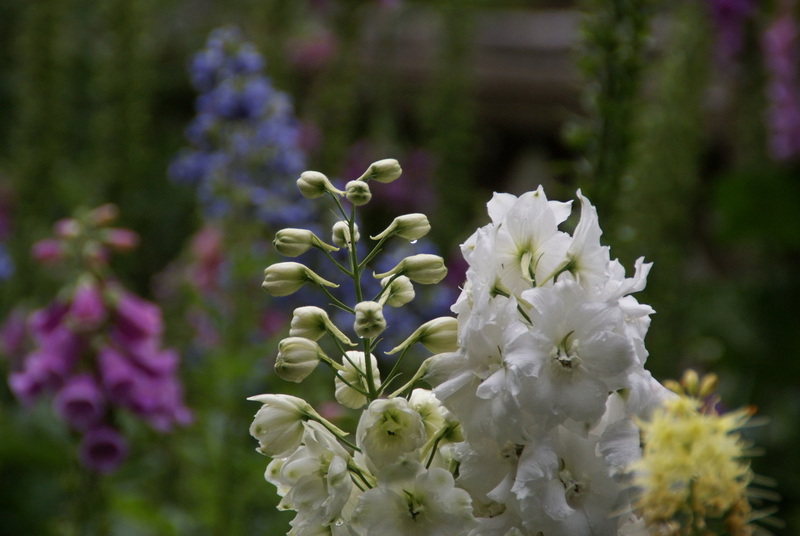 They make wonderful companion plants to the delphiniums and foxgloves. Writing this post makes me almost feeling a little bit sentimental. We had such an incredible good time in England and I am very grateful that we were able to visit this beautiful country. 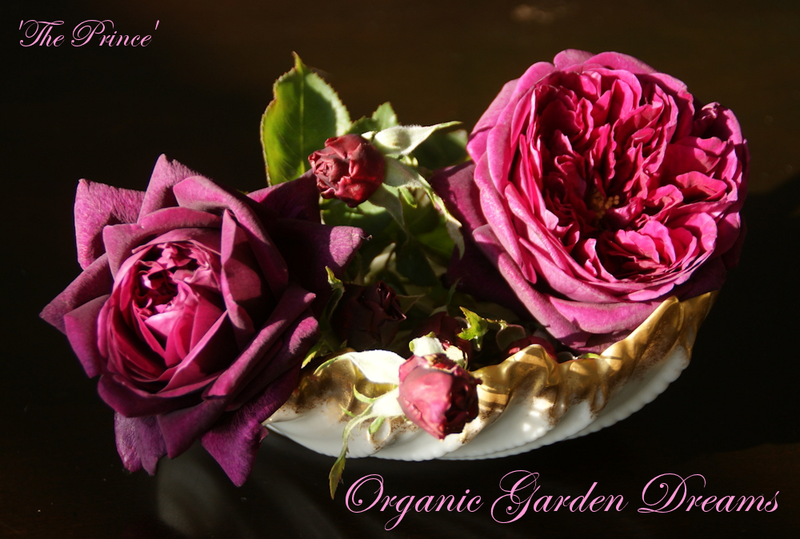 Besides very fond memories I took home so much garden inspiration and ideas, they will nurture me for a long time. Still I wish that I can go back there some time not too far in the future. This are images from a fairy tale, Christina ! Thank you for this wonderful post. 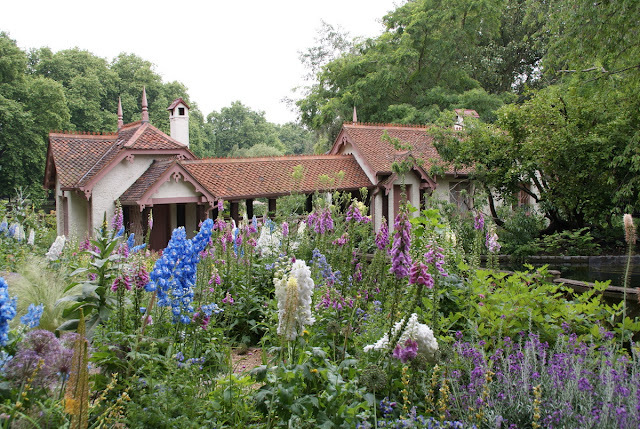 Oh Christina ~ I love, love, love this charming cottage and gardens. It inspires me to keep on working with our own little cottage and grounds. Living in warmer climates like you and I do, we have to find substitute flowers to grow in our own gardens. If I lived near that garden and park I'd want to visit there regularly, it speaks to my heart. Just lovely and quaint, Christina. I love tall flowers, but I'll need to be better prepared in the future to stake them - diligently. You are right - it looks like a lot of work, but wow, so worth while. Dani, thanks, I am glad that you liked my post! FlowerLady, thanks for your nice comment! 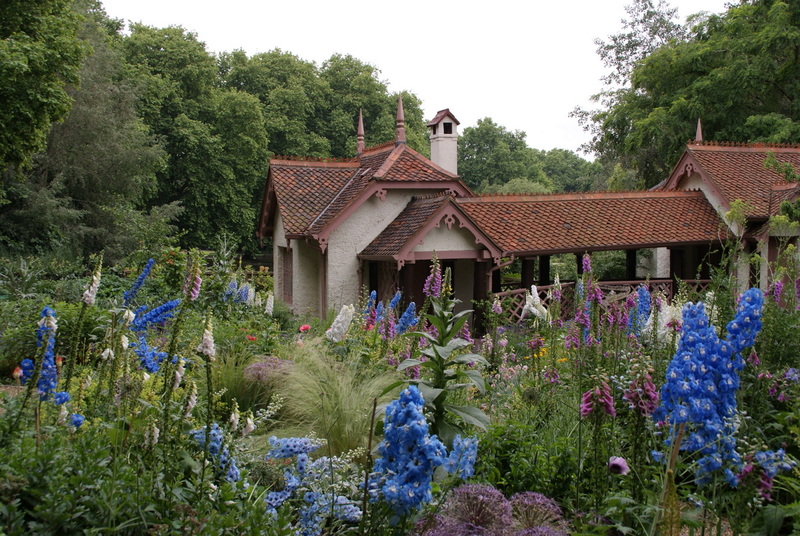 I feel inspired by this beautiful garden to work on my own to make it more pretty, too, even though I most likely will never come even close to the beauty and perfection that this cottage garden radiates. Sherry, nice to see you commenting on my blog again! Yes, unfortunately some tall flowers need to be staked, but heh, if they (the Brits) can do it we can do it, too :-)! Holley, sorry, somehow I overlooked your comment when answering to the others. 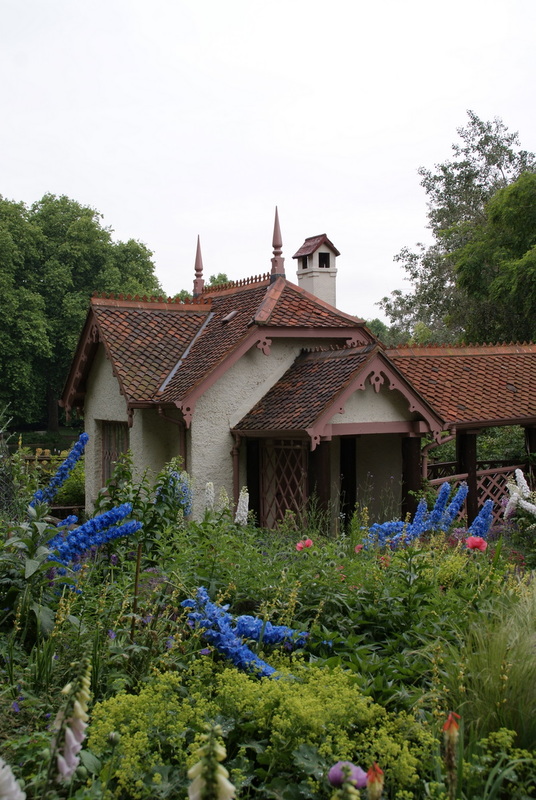 I also had the fantasy how it would be to live in that cottage. I could see a lavender walk in your garden, I think it would be very pretty! I hope that one day, my garden look like this.How much peace and quiet is in that garden. What a charming and beautiful garden! I love all of the delphs and the lavender. Mihai, thanks for you comment! There was that much peace and quite radiating from this garden that even the squirrels seemed to fit right in there there! sweetbay, thanks for visiting my blog and leaving a comment. 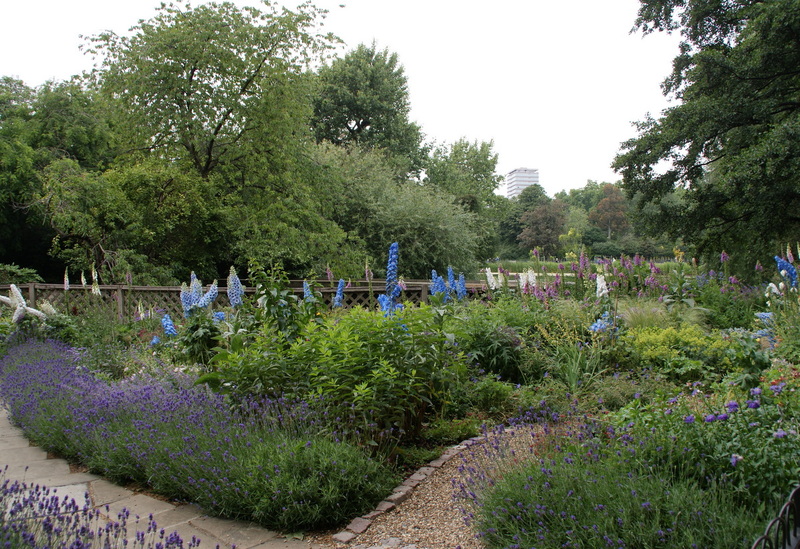 I am madly in love with the delphiniums and lavenders, too :-)! What a fantastic discovery! I didn't know it was there, and next time I'm up in the 'big smoke' I'll try to pop to the park for a gander. 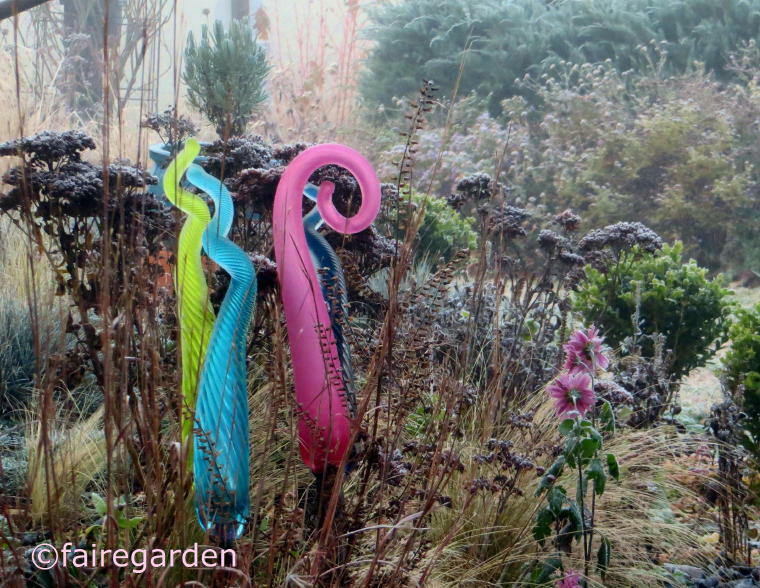 The planting looks divine. I'm afraid I'm one Brit who doesn't have much patience with staking! Martin, yes, if you can make it have a look at the Birdkeeper's Cottage in St. James's Park it is so well worth it. I am wondering if they change out the plantings with the seasons... Regarding the staking I am glad that you belong to the regular, "just human" gardener crowed like me, not to these ueber-gardeners ;-)! 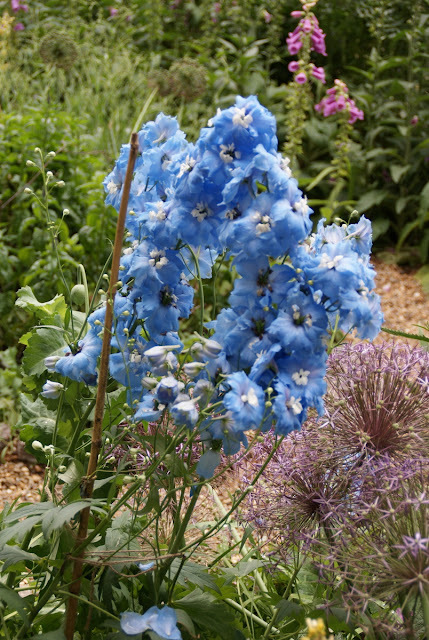 Hi Christina - I recently planted a few Delphiniums in my garden - nothing as spectacular as yours - I do hope the will thrive. Yours are quite a sight to behold and make me truly hope mine settle in and grow. Lovely photographs!! TheGardeningBlog, delphiniums are so wonderful plants, I hope yours will do well for you! I agree the delphiniums at the Birdkeeper's Cottage (hope you realize that is not my garden) where especially tall and lush, don't know what they did to them... Thanks for your compliment on my photos!